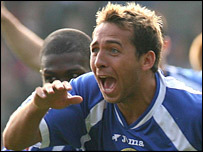 Cardiff City striker Michael Chopra has pledged his future to the club by signing a contract extension. The 23-year-old, who has scored 21 Championship goals this season, joined Cardiff from Newcastle United on a three-year deal in June. "I've signed an extension because I believe the club is going places," he said. "I'm doing well for myself this season and the team's doing well. "We've just got to give it that final push to try to get into the play-offs." Negotiations over a new contract started at the end of February after Chopra's double in the 4-1 win over Preston activated a clause in his contract which entitled him to improved terms. "The fact that we have this week signed Michael Chopra on an extended contract demonstrates to supporters that when we find good players, we try and tie them down," said Cardiff chairman Peter Ridsdale. "It is also important that we demonstrate that we stand by our word because we committed to Michael at the start of this season that if he scored twenty League goals in 2006/07 that we would re-negotiate his contract and that is what we have now done." Chopra alarmed Cardiff fans earlier this season by claiming he could leave if the Bluebirds failed to win promotion to the Premiership. But the England Under-21 international now insists he wants to stay at Ninian Park irrespective of which division they find themselves in next season. "I wouldn't be signing a new contract if I didn't want to be here," he said. "I believe Cardiff are going to be in the Premiership - all the players do. If the club is going to sell me, that's not up to me. That's up to the chairman and the manager if they want to cash-in on me. "I don't know what their plans are, but the main thing for me is to keep working hard and scoring goals." After finding opportunities limited at Newcastle, Chopra rejected an offer with his hometown club in favour of joining the Bluebirds in the summer in a £500,000 move. He has scored almost half of Cardiff's league goals so far, taking his potential transfer worth to the £5m mark. "It's down to confidence," Chopra said. "I'm playing with a lot of confidence now and it's helping me. "When I was back home at Newcastle it was hard because I knew I wasn't going to be playing every week. "I was getting down at times, bit I told Cardiff at the start of the season that if I would be playing week-in-week-out I would score 20 goals. "I've done that and I'm very happy. Hopefully it can continue."